Just make sure you choose the best blender for the job. Once you decide on your priority for your new blender, you’re ready to buy. Here’s some information to help you along the way. In a Hurry? Need a Blender fast? If you’d like to skip ahead, please click on one of the links. When I make a smoothie for myself, I prefer to use frozen fruit and less ice. It’s not everyone’s idea of a smoothie, but that’s how I like it. And this is the best blender to do it. This blender is perfect for frozen fruit. If you need to crush lots of ice I wouldn’t get this blender. It’s not built for that. It will cope with ice in smoothies or crushing ice on occasion. But if you want to crush lots of ice for a party or you need snow ice every day for drinks, please see the ice crushing recommendation below. This is a classic countertop kitchen blender. The Oster 6812 blender has a glass jar with 6 cup capacity. Like all Oster blenders, it includes an all metal drive for improved durability and performance. The two connecting pieces from motor to blade are metal, not plastic. Oster gives a 10 year warranty on the metal drive. The glass jar is made from shatterproof, boroclass glass and is very durable. This is great if you’re using frozen fruit or ice. The glass jar is dishwasher safe for easy clean up. There are 16 speeds starting with stir, blend, puree right up to shred, liquefy and ice crush. It’s also handy to know there is a 2 ounce filler cap with markings on it to pour ingredients directly into the jar while blending. Great for making recipes like your own healthy version of mayonnaise or ranch dressing. It has 700 power watts with 450 blending watts. Plenty of power for smoothies. 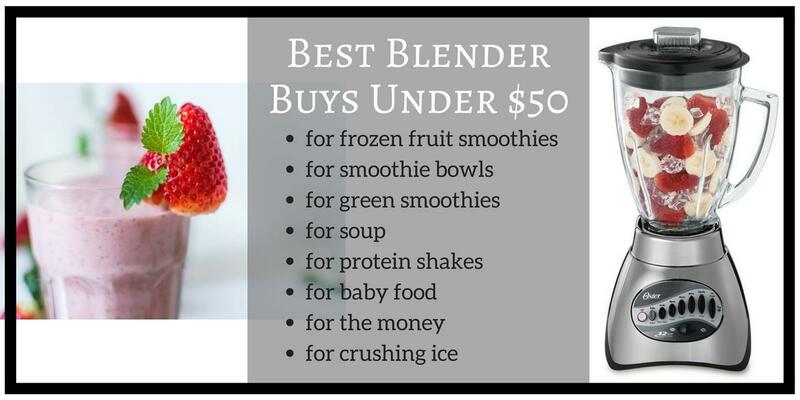 This really is the best blender under 50 for great value if you love frozen fruit smoothies. Who can resist a delicious smoothie bowl for breakfast? So delicious and so full of nutrition. The Hamilton Beach Wave Crusher 54220 blender is really good at making thicker smoothies for a smoothie bowl. The 40 oz. glass jar provides durability if you’re using ice in your smoothie bowl recipe. And if you’re using frozen berries, it’s perfect. This is the best blender for smoothie bowls. How do I get it really thick? Of course, there is a process to follow, as for any blender to get it both thick and smooth you need to make sure there are enough ingredients around the blades for it to keep blending. For the price of this book you get a brilliant selection of superfood recipes. Smoothie bowls go further than smoothies with all those wonderful healthy toppings. This is the same for any blender unless you’re going to spend several hundred dollars on a high speed blender. But it’s not difficult. You just need to add some liquid in the bottom of the jar first. If you only have large ice cubes in the bottom of the jar near the blades it may not do a good job at drawing the other ingredients in towards the blades to get the blending process underway. As I said, this is the same process with almost all blenders. It’s just about getting the blending started. You may need to start with the pulse button to give the food a chance at coming together. Then, once it gets going you can increase the speed until you have a super smooth and thick smoothie. I love eating a thick smoothie out of a bowl with lots of healthy nuts and seeds on top. I know lots of people like a smoothie bowl for breakfast but my favorite time for one is lunch. Such an easy and filling lunch. You can even make the smoothie ahead and pop it in the fridge so it’s ready for lunchtime. By including the nuts I find it stops me snacking during the afternoon which is good when you’re watching calories! The Hamilton Beach Wave Crusher 54220 is the best blender for a smoothie bowl recipe if you’re looking for great value. You’ll be enjoying a lot of deliciously smooth and thick smoothie bowls with this blender. The Oster Simple Blend 100 blender is great for green smoothies. It will blend the stalks of leafy greens, arugula, parsley or cilantro with ease. It even comes with a blender cup for smoothies. This is the best blender for making green smoothies conveniently and without buying an expensive blender. For the price of a Smoothie Recipe Book you’ll get great ideas for nutritious smoothies. The blender jar is BPA-free plastic and holds 6 cups. It’s dishwasher proof for easy cleaning. There are 10 speeds with 700 watts of power and 450 watts of blending power. This is the best value blender. It’s such a cheap price but delivers on performance. It includes the special Oster all metal drive and comes with a 10 year warranty on the drive. There are 10 speeds and the pulse button. You have the choice of buying this blender in black or white. So, coordinate the colors in your kitchen and choose the color you want to wake up to each morning to inspire you to make a delicious green smoothie. Personally I really like how light and bright the white appliance is for summer smoothies but to be honest the black blender is my choice because it matches the rest of my kitchen and looks quite sophisticated. I know it’s not a big deal but I like to have choice in my appliances, so that’s why I mention it – in case you do too. Apart from the color, you really just need to know that this blender will do a great job making your green smoothie. It is the best blender for the job. It will blend everything to a good smooth consistency. And with the convenience of the Blend and Go cup you can enjoy your smoothie on the way to work. It really is a good blender. At this price, you’ll want to buy two! The Oster 6811 has a glass jar that has been thermal shock tested. This is perfect for blending hot food to make soup. Of course, with any blender, you don’t want to blend boiling liquid. This would be dangerous. But you can easily blend warm/hot soup in this blender with the glass jar. It’s the best blender for pureeing soup after it’s cooked. It has a 6 cup capacity and is dishwasher safe. The thermal shock testing means you can also take the glass blender jar straight out of the dishwasher and use it to blend cold liquid without the risk of cracking the jar. When would I use this blender? Personally I love making “dinner soup” for the kids when they refuse to eat their meat and veggies. I take the hot food out of the pan and blend it in the Oster 6811. This turns their dinner into a delicious soup. I usually don’t get any complaints from them after that. For the price, this recipe book gives you plenty of new ideas for soups. Even though the author (herself a chef) states you can use an immersion blender, she herself prefers a traditional counter top blender. And I have to agree, that’s what I prefer too. I should mention that when I make a “dinner soup”, I cut the meat into pieces before pureeing it in the blender. It probably wouldn’t be able to deal with really large pieces of meat. If that’s what you need, you may need to spend several hundred on a high speed blender with extra sharp blades. This Oster blender has 700 watts of power with 450 watts of blending power. It’s powerful enough to make great soups, smoothies and purees. Like all the Oster range of blenders, it comes with the all metal drive with a 10 year warranty on the drive for peace of mind. There are 12 speeds including a pulse button and an ice crushing speed. It is easy to start slow, get the larger ingredients of your soup drawn into the middle of the jar and then increase the speed to achieve a nice smooth puree. And you can stop it earlier if you want to make it as a chunky soup with texture. This blender is high quality and versatile with lots of speeds. It is the best blender for hot soups because of the glass jar. It’s also a great price. You really can’t go wrong with the Oster 2811 blender. You’ll enjoy making many delicious soups in this blender. This is a great little drinks blender. It’s perfect for protein shakes, especially if you only need to make it for one person. A lot of larger blenders are really too big for the job. This Hamilton Beach 51103 blender has a 14 oz. capacity, it has a smaller footprint so it doesn’t take up too much space on your counter and there’s a clever way to store it with the cup upside down and the lid attached on top. This really is the best blender for protein shakes because of its convenience. Can I use ice in this blender? You can still add a little ice or frozen fruit to your protein shake in this blender. Obviously you don’t want to try and crush large volumes of ice. It is not built for that. It’s a smaller drinks blender, not an ice crushing high speed blender. Just be aware that if your ice cubes are at the bottom of the blender the ice may not be drawn into the blades and the blending may not get underway properly. Try to make sure there is some liquid around the blades when you start the blending. It’s the perfect blender for protein shakes because it’s so easy to rinse out and clean. If you want to blend a protein shake more than once per day it becomes difficult to always be washing a large blender. The Hamilton Beach 51103 blender is also easier to get out of the cupboard because it’s smaller. It’s simple to operate and easy to store with the cord wrapped around the base. And there’s a travel lid which lets you drink directly from the jar after blending. This is so convenient for protein shakes if you need them pre or post workout. At this price, you really can’t go past this Hamilton Beach blender for value. If convenience and good value are important to you, you’ll love this blender for protein shakes or other drinks. It’s the best blender for drinks. I love using my Magic Bullet Blender for baby food. I use cooked vegetables and meat, chicken or fish. It blends into a fine puree. And it’s so easy to rinse afterwards and then keep using for another purpose. It’s the best blender for making smaller servings like those for children. For the price, you get lots of great puree recipes as well as other recipes for when your little one gets to a toddler age. As the children were getting a little bit older I would puree their dinner of meat and vegetables and then rinse out the blades and cup and then blend their fruit with a little liquid and this fruit puree would be their dessert. When I used a larger blender I could never get the serving size small enough to actually puree properly yet still be small enough for a child. I ended up wasting a lot of food with all the leftover purees getting lost in the back of the fridge and having to be thrown out. The Magic Bullet Blender is perfect when you’re a time poor mom with young children. I could get them in the high chair, blend the food in the kitchen straight out of the pot (but lower than boiling temp), and then be ready to feed a hungry baby before he got impatient. If you have children, and you haven’t tried a Magic Bullet Blender yet, it’s time. You won’t be disappointed. I have seen so many moms have the same reaction as me to the Magic Bullet Blender. They all wonder how they lived without it. It is the best blender for any family with children. For the price of this book it’ll show you how to make 3 months of homemade purees in 3 hours. You’ll love the food combination suggestions. The Magic Bullet really is essential for pureeing baby food. It also makes a great gift for a new mother if you can’t decide on what to give her. Not only does it make great baby food but you can also make healthy smoothies for yourself. Sometimes we don’t eat right when we’re sleep deprived and distracted by kids. But with the Magic Bullet blender you can toss a whole lot of healthy ingredients into the jar and whip up a healthy green smoothie or high protein smoothie for lunch. With so many practical uses, you’ll really enjoy having a Magic Bullet blender in your kitchen. It’s the best blender for baby food but it’s also an appliance you’ll use in your kitchen several times a day every day. This blender gives you a lot for the price. It has a glass jar with 40 oz. capacity. There’s enough power to blend soups, smoothies and purees. And the lid includes a special no-mess pouring spout which is hinge-attached to the lid. As you can tell, with so much convenience, you’ll love having this blender in your kitchen. It is the best blender for the money. The jar is dishwasher safe for easy cleaning. And it has 12 blending speeds so you can start slow and build up to a smooth consistency. Hamilton Beach uses what they call a “Wave-Action System” which pulls the food into the center of the blender to bring it all together to get a smooth result. The Hamilton Beach 58148A blender can crush ice and blend frozen fruit but I wouldn’t try to do heaps of crushed ice all the time. It’s not intended for that. If you need to crush lots of ice, you’ll need to buy a high-speed blender. But having said that, if you need to add ice to a smoothie or use frozen fruit, then this blender is perfect for making you a great smoothie every time. You can make soups, purees, smoothies, baby food, protein shakes, sauces and dressings so easily in this blender. If you like the convenience of a powerful and easy to clean blender, you’ll be happy with this blender. For the price, this is a great value blender. If you know you’ll be using a blender for lots of different purposes, get the Hamilton Beach 58148A. You’ll be happy with the results. This blender stands out with 1,000 watts of power and extremely sharp blades. When it comes to ice crushing I just couldn’t keep the limit within $50. To get good results, ice crushing needs more power than a cheaper blender and sharper blades. Don’t get me wrong, if you want to add ice to a smoothie then the other blenders mentioned in this article are great for the job. For smoothies you don’t need to spend more on a blender. If you want to make cocktails with your blender, you’ll love this book. But for crushing ice for snow cones or margaritas then this is the blender for you. The Ninja Professional Blender BL610 turns ice into snow without a problem. I love the way you can make lots of snow for drinks when you have friends over. With a cheaper blender it doesn’t have the power to keep crushing ice. If you use it for a lot for ice you’ll burn out the motor quite quickly. Whereas, the Ninja Professional blender is made for crushing ice. What is the jar made of? It has a large 72 oz. blender jar. Unfortunately the jar is plastic, not glass. But you need to know that the advantage is, it’s lighter. This really is an advantage on larger blenders because once you fill them up they can get a bit heavy. I tend to have problems with my wrists so I always appreciate lighter kitchen appliances. This plastic jar is very high quality. It does not feel like a cheap plastic and it seems to be durable. It’s dishwasher safe, for easy cleaning. There is a very functional spout in the lid. This spout can open up to pour from. Hence it’s very handy since the lid locks in place. Did I read something about the blades being dangerous? Just one word of warning with this Ninja Professional Blender, the blades are very sharp. There are 6 blades along the axle and they are spaced quite high up. It is actually quite easy to pull the blades out. This is not a problem. There is a black plastic part at the top, to hold on to, and lift the blades up out of the jar. So, in summary, I’ve never had a problem with the blades but if you read reviews, some other people have cut themselves on them. Therefore, please be aware, these blades are sharp. If you’re prepared to go beyond $50 and spend a bit more, this Ninja Professional blender is well worth the money. I think you’ll be happy with it. And if your priority is crushing ice, it’s definitely the blender for you. ⇒ If you’re interested in buying the best Bullet Blender, see detailed reviews, click here. ⇒ What about a Rice Cooker? See the Best Value Rice Cookers on a Budget, click here. ☑ Looking to buy one of the best induction cookware sets? ⇐ See more details here.